It was 1946; the country was still ruled by the British. 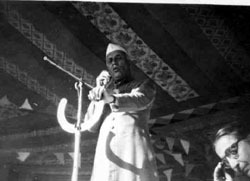 Sir Francis Verner Wylie G.C.I.E, G.I.E., K.C.S.I., I.C.S was the Governor of United Provinces, now Uttar Pradesh. He was on a visit to Bareilly, a small town in the Rohilkhand Division of United Provinces. I was a small kid of five then and one evening while being taken on a walk to the Company Garden saw the Circuit House en route had been surrounded by the Gorkha and the Yankee sentries. The shining bayonets of their rifles and the well creased, starched uniform and the aura of their smartness made a big impression on the kid. What made a still longer lasting impact was that further entry on the road to Company Garden had been prohibited. Perhaps the security of 'Laat saheb' as the Governor was known, was at stake and I had to miss my fun on the swing and the slide. Within few months we attained freedom and Pundit Jawaharlal Nehru became the first Prime Minister of the Independent India. It was 1956; I was a young lad of 15 and a keen hobbyist. A Box camera used to satisfy my craving for photography. One afternoon on way back from school I found lot of commotion near our house and soon learnt that Pundit ji was expected next door to inaugurate a school. I forgot my lunch and also my tutor and rushed to the site with my Box cam. The venue was swarming with sentries but they did not look tense as those Yanks of the pre-Independence days. I had hardly managed to reach close to the barricade, when a siren blowing jeep and whistles of the sentries heralded the approach of the PM's cavalcade. 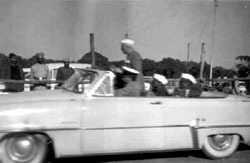 I caught the fleeting glimpse of his convertible limo with Nehru ji standing and waving at the crowd. Within seconds I was able to sneak through the barricade and reach close to the dais. Accompanied by Sampurnanad ji, popularly known as the 'Babuji', the Chief Minister of Uttar Pradesh, the other dignitaries took their seats on the dais. 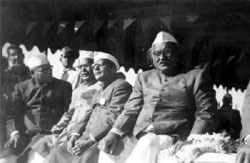 Unlike today, those days the dais was not air-conditioned and the dignitaries preferred to sit on the floor. Though I was just a youngster I could dare to stand barely six feet from the Chief Minister. One possibly can not do so now perhaps even in his dream! Durga Bhabhi, the heroine of the famous Kakori Bomb case welcomed the guests. It was much later I learnt that the founder of the school was such a respected revolutionary of her hay days. 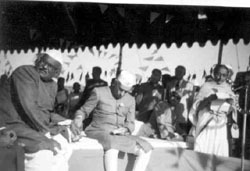 Pundit Nehru was browsing his notes while the welcome address was on. In between he looked straight in to my eyes and gave his disarming smiles. By the time Pundit ji was requested to address the gathering, I had become bold enough to take few more close up shots. Fearing I may distract him during his speech, Durga bhabhi repeatedly rebuked me. But Pundit ji had his own way of dealing with kids and youngsters. He asked her to let me shoot and even posed for a close up. Having seen the water tight security of the British Governor and also the ease with which it was possible to go close to the Prime Minister the difference between a slave and a free country had become clear to me at a young age. The present security is a reminder of the British Raj when the ruler maintained a safe distance from the ruled. Tryst with Nehru will remain forever with me as a sweet memory.